Working for a Denver Area Council camp is not just a job, it's a lifestyle. The Denver Area Council is looking for a few good men and women who have the "Right Stuff" to join our camp staff. Spending your summer at either Peaceful Valley Scout Ranch or Tahosa High Adventure Base will provide you with an opportunity to not only have the adventure of a lifetime, but to also affect the lives of thousands of youth from across the country. Working on camp staff is a great opportunity to spend your days outdoors while changing lives! Spend your days taking Scouts on hikes, teaching them how to shoot a gun, or relaxing with them in the evenings as you all sit around a campfire telling stories and watching skits. Other benefits of working on staff are: summer housing, three meals a day, time off on the weekends, working on your tan, and making friends from around the country and even world. Counselors in Training: Age 14 & 15; Want to dip your toes into life as a staff member? Join us for a couple weeks and we'll teach you everything you need to be an amazing staff member. CITs are asked to volunteer at least three weeks during the summer, and are given meal and lodging, and starting in 2019, earning a FREE week at either Peaceful Valley Scout ranch or Tahosa High Adventure Base. Program Counselors: Age 16 & older; Our Program Counselors are the heart and soul of summer camp. Program Counselors teach skills to our campers, lead activities, perform skits and songs at campfires, and do what's necessary to keep camp running smoothly. Apply to work in an area that suits your skills like shooting sports, climbing, aquatics, handicrafts, outdoor skills, STEM, Hollywood, cycling, and much more! Operations Staff: Age 16 & older (Trading Post Clerks) Age 18 & Older (All other Operations positions); Our Operations staff work behind the scenes and "make it happen." If teaching isn't your thing, but you want to make camp run these are the positions for you. Positions include Maintenance Quartermasters, Assistant Rangers, Trading Post staff (clerks, Manager, Director), Office staff, Dining Hall Steward, Commissary Director and Assistant and Health Staff. Camp Administration: 21 & older; maybe you've spent a few summers as an Area Director, and think you can make camp even better? Maybe you have outside leadership experience and can apply that to camp operations? Apply to be on the leadership team to help plan summer camp throughout the year. Camp Director, Program Director, Assistant Program Director & Business Manager positions available. 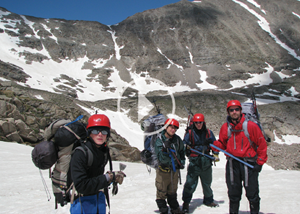 Camp Leadership positions require a commitment during the months leading up to summer camp. For all positions (except for CIT's), please contact the Camp Director for the camp you are interested in to schedule an interview. CIT's should contact the CIT Director Mason Huyge. For more information, please review the Peaceful Valley Scout Ranch and Tahosa High Adventure Base job descriptions by clicking on the job name, or the location of there are multiple locations. A job description will be downloaded for you. Uniforms should be ordered before camp. The store is OPEN for the 2019 season - please make your purchases by April 30, 2019. Please consult the Uniform Sizing Guidelines before ordering. Please refer to the Uniform Guidelines to see which items are required or optional, as well as can be purchased online or which items must be purchased in person from the Denver Scout Shop. A 25% discount coupon is available for download for uniform items required from the Denver Scout Shop. Click here to access the store. Uniform Store - 2019 Orders Due April 30, 2019. Looking to volunteer with a National Youth Leadership Training (NYLT) course? Visit NYLT.org/Staff for more information!